2010 Northern Rockies Wolf Report released. NRM population estimate down from 1731 to 1651. Minimum population estimate down significantly in Idaho from 870 to 705. The 2010 Northern Rocky Mountain Wolf Reports are out and they show a decrease in the overall wolf population. Wyoming and Montana saw slight increases while Idaho accounted the decline seen in the overall population. It has long been predicted that wolf populations would level out and possibly decrease as seen in Yellowstone but it is hard to attribute the declines to any particular cause. It could partly be attributable to last year’s hunt which occurred partially during the wolf breeding season and afterwards, a reduced elk population , increased poaching, difficulty in monitoring, and other factors could play a role as well. Keep in mind that these estimates are minimum population estimates and that the actual population is higher. All of the discussions I have had with the people who do these counts indicate that they feel that while these counts are not complete, they are within 20% of the actual counts and are probably accurate with regard to the trends that they show. Wolves of the Northern Rocky Mountains: U.S. Fish and Wildlife Service. Sen. Benjamin Cardin, a Maryland Democrat who blocked efforts to take wolves off the list in the last Congress, issued a statement this week to The Associated Press saying he remained opposed to a legislative solution to the issue. Wolf population estimate by state. 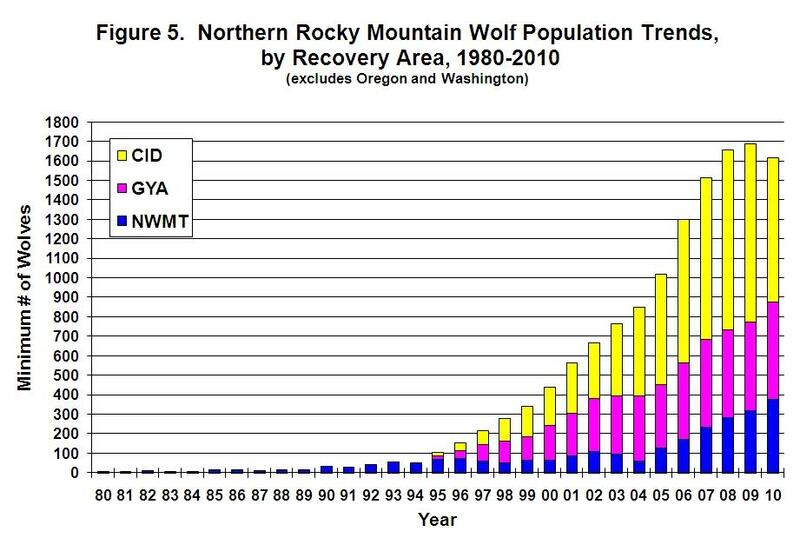 Wolf population estimate by recovery area. 3 Responses to 2010 Northern Rockies Wolf Report released. Just in time to print out for some weekend reading. Thank you for keeping us informed in “real time”. People should remember that the anti-wolf people have been saying the wolf population will grow to a size beyond all limits and will prove impossible to keep at a reasonable level. There are still saying this, and many in the media will probably not stop to check these figures. People should call Cardin’s office and thank him for his leadership on this issue. My basic question is- where are the rest of the Democrats on this issue?